Some autobiographies begin and end without the reader gaining a true understanding of who the author is. Two Shadows is not one of those, and instead is a compelling account of a life that could have gone horribly wrong. We follow Charlie Winger from the streets of Chicago to prison after a string of theft-related crimes. There, he earns his high school diploma and learns enough about computer programming to begin a career in the industry upon his release. 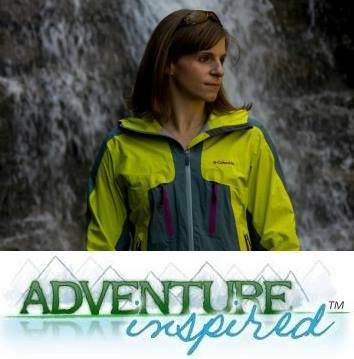 He discovers a passion for mountaineering, which leads him around the world and up mountains like Denali and Aconcagua. 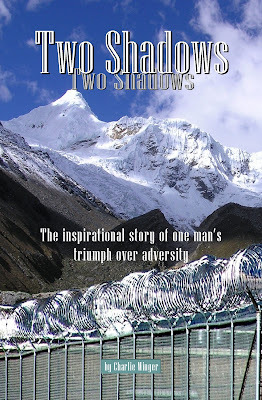 As both an autobiography and an adventure story, Two Shadows is unique. It's not a romantic novel, nor does it glorify Charlie's many achievements as a mountaineer. Instead, it's a raw, unfiltered look at his life, misadventures and all, delivered in a colloquial, candid fashion. Each series of events is punctuated with his sense of humor; it's as if you're just sitting around the campfire with Charlie. All in all, it's a fantastic read for anyone interested in mountaineering or who wants to be inspired. "For many years as I climbed mountains, friends would say 'you should write a book,' but I realized that there were many more books available with far more interesting stories. As for Two Shadows, I started thinking about its concept a few years ago and became more interested when I decided to apply for a Pardon from the State of Indiana and as a result of being denied entry into Canada. I initially wrote the book for myself, but Diane encouraged me to make it public, a decision I had mixed emotions about. What will people think about me when they know the truth? Well, some of that got answered when friends asked me why I couldn't/didn't go to Canada. It was sometimes painful to relive those past events. I had gotten them out of my conscious mind until the Canada event brought everything roaring back. From that period on until we walked out of my Pardon hearing this June, I relived many of those events during my waking and sleeping hours. I was curious just what and when I changed to become the person I should have been from the beginning. I didn't come up with any answers. It was a mystery. When I had prostate cancer surgery followed four months later by my climbing accident, those times provided me with the catalyst to search for answers. So I started writing, attempting to write down everything I could remember (who knows what tricks the mind plays with memories), and then went back to reconstruct the events chronologically. As the story began to unfold, I started to see a pattern to my behavior. I now think many of my actions were anger-based as a result of my home life both in Chicago and in Kansas. The crimes I committed were against property, not violent behavior against other persons. I've noticed that behavior of my type seems to have a 'domino' effect. The current event isn't necessarily stand-alone; it's related to things in the past. We carry a lot of baggage along with us as we proceed though life and sometimes the suitcase breaks open and spills its contents. You asked what gave me the strength to make the necessary behavioral and life changes to become who I am today. I think I probably matured and was away from the factors I blame for my situation. I had a tough life in prison as I was the youngest inmate incarcerated there at the time. When I started to work to complete my education, I got positive feedback in the form of good grades - instead of the back of someone's hand - and that went a long way to helping me look up instead of down. A few people reached out and helped me when I lost my way, so they kept my rehabilitation on the right track. There are so many factors and critical times in our lives when one small decision creates a major life change, for the better or worse. I can think of a couple of mine but, to be sure, getting caught and incarcerated actually saved my life. I wish things could have been done differently but who knows what type of person I would be today. I'm proud of what I've accomplished and the manner in which it occurred." When I asked Diane if she’d always been passionate about mountaineering, she divulged her standing as a true couch potato until her late thirties. “I was one of those people who would say, ‘I love to hike’ but never actually went hiking, claiming that I didn't have anyone to hike with. 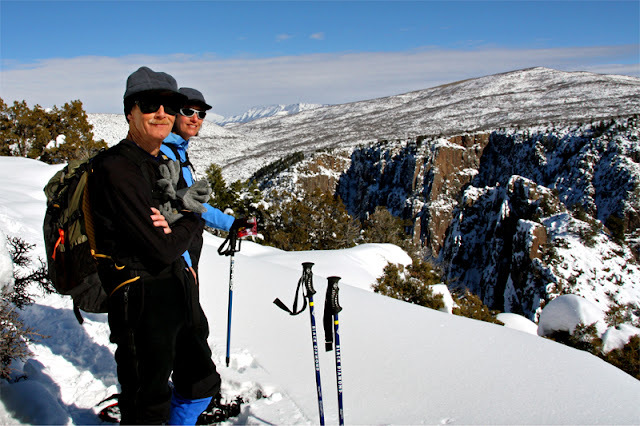 But then I joined the Colorado Mountain Club, and found I could hike every weekend, take classes to learn to rock climb, use an ice axe & crampons for snow travel, telemark ski, and so on. I was hooked!" "As time went on, Charlie taught me additional skills, and was always there to be my own personal guide when I'd step out of my comfort zone to try more technical climbing. 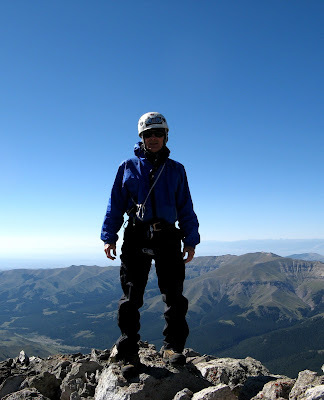 Several years ago, I decided to go for what was for me the ultimate objective -- a climb of Mt. Rainier (my 49th state highpoint)...I made the summit. That was my "Everest" -- far beyond anything I thought I'd ever accomplish in the mountains. And I also confirmed that I really don't enjoy glacier travel, or even being on anything requiring crampons, for that matter! So, I'm sure I'll stick with being in the unofficial 49ers Club with my motto: ‘Just say no to Denali.’"
Win a Copy of Two Shadows! If you're interested in reading Charlie's story, here's your chance. In the comments section below, tell us about a challenge you've had to overcome, big or small. And though not required for entry, head over to Facebook and give the Adventure-Inspired and The Winger Bookstore pages a "like!" The entry deadline is 5:00PM EST Friday, November 11, 2011. Good luck! And if you don't win, you can always visit the Winger Bookstore to pick up a copy. You'll want to visit the Bookstore regardless; Diane and Charlie have a super exciting new project coming out - "Because It's There - A Photographic Journey." UPDATE: Entries have closed, and Philip Werner of Section Hiker is the winner! Thanks for entering, all! If you'd still like a copy of the book, visit the Winger Bookstore. Hey Katie, great review and post. Had no idea you were even reading Two Shadows. Charlie and Diane are wonderful people. Had the pleasure of visiting them in Colorado about two months ago. I consider myself fortunate to be able to count them as friends. Thanks, Bill! We feel the same way about you. P.S. Don't forget: we need MORE maple syrup! Good for you for seizing the opportunity to find good things in a time that was incredibly challenging for you, Jess! Thanks for reading and for telling us your challenge. Thanks Bill! Hopefully I'll get to meet them both in person someday. My biggest challenge pales in comparison. I used to be a workaholic and never had time for anything except work. I managed to overcome this and focus on making a life for myself, but it wasn't easy. Hiking and kayaking did become my passions though and work is now in the back seat where it belongs. It's stories like this that really are inspirational. I love reading these types of books and such, because it packs more punch than the normal crime story or something like that. Life lessons can be learned. As for challenges, I don't have any that really compare and I would say most wouldn't. My biggest challenge is happening right now as I was a victim of the economy and the newspaper industry. Being out of work for so long has made me learn to be a bit more resourceful, in monetary terms and in life terms. You don't realize the human mind and feelings one person can have until faced with adversity like this. Through it all, I've done my best to stay upbeat and positive, despite feeling like I've been booted to the ground many times. I keep plugging. I hope that my challenge has a happy ending soon enough. But this would be my challenge and the biggest one I've ever had to face. I think it's all about perspective, PJ! Everyone's biggest challenges are different, and what might seem small to you could be huge for someone else, and vice versa. Learning how to bounce back after economic hard times is a big challenge. Keep working hard! Balance is a huge challenge, Philip. Finding time to fit in work and play is one of the things I think we all struggle with. Glad you've found a way to accomplish everything you want to do! Thanks, Sarah. We really appreciate your comments.